Life is one challenge after another and just when you think you have passed one test, here comes another. Each challenge is meant to push you to the next level, to test your mental and physical acumen, and to help you grow and change. But are you ready for the challenge? Truthfully, none of us are quite ready for the challenges we will face, but rest assured, each of us is properly equipped to handle them, even if we do not think so. There is a plan and a purpose in the process and it is up to us to persist in order to prevail. Every challenge is meant as a stepping stone for us to reach new heights, but in order to move up you have to be willing to take the first step and then not be afraid to continue the course. No one started out on top. Every professional was once an amateur and every expert started out as a novice. So what makes you think it would be any different for you? Change is inevitable, but how you adapt to and apply what transpires makes all the difference. Do not fear change, do not run from it, do not rebel against it. Whether you can see it now or not, change is good and it is the only way we can progress and elevate our lives. 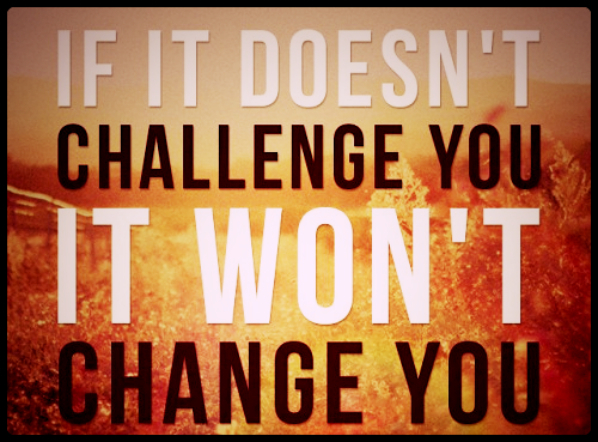 If it does not challenge you, it probably is not productive or progressive either. Do not limit your challenges, challenge your limits! Change is good, but most people do not like change. Change makes people fearful and they cannot handle the task before them. My greatest fear is failure! If I try the change and i fail I will be embarassed. That is were God comes in. I need to stay in prayer and keep the faith to challenge the change. Change is good. This was a good topic for me. I have a change coming in my life and I really needed this word to encourage me. Sherel, I am very glad this word touched you in some way and is encouraging you through whatever changes may be on the horizon. As much as people fear and are leary of change, change is indeed a good thing. Change is a form of growth, progress, and through change we learn to overcome and withstand the trials and tribulations we face. No matter how much we fight against it, change is the one common in life none of us can avoid. The more we embrace change, learn to adapt and maneuver, the better we can adjust and the easier the change process becomes. Additonally, change teaches. It forces us to become patient, to learn ourselves – our strength and weaknesses, and gives us invaluable tools to navigate life’s many challenges. Whatever change is forthcoming, know that you are prepared and no matter what it may be, God is guiding you, walking with you, and protecting you. Walk in faith knowing the vicotry is already yours! Thank you for sharing with BrotherWord. Stay Blessed!